If you yearn for an authentic country getaway for a weekend break , we have the perfect location – an original octagonal eco cabin, built ‘hobbit’ like into a hillside in Ceredigion. Where is Kere-digion? do I hear you ask? The county that this quirky new building resides in is a hidden gem. Situated in mid-west Wales, on the coast just above Pembrokeshire, the Welsh speaking county of Ceredigion is largely undiscovered by the holidaying hoards from England. The Romans came here, but only in their desperation to seek out gold and other precious metals, they never properly colonised this wild Celtic region. The area was named after ‘Ceredig’ an ancient Welsh king of circa 420 BC. His former kingdom Ceredigion is bounded by the River Ystwyth at Aberystwyth in the north and the River Teifi which meets the sea in the south at Cardigan. The whole of the County’s western edge is bounded by Cardigan Bay with views across the water to holy Bardsey Island and Snowdonia. From the East there are only two main roads into the county. These roads wind through the forbidding Cambrian Mountains chain. Thankfully there are no motorways into Ceredigion ensuring that the countryside has remained unspoilt and feels as if it is yet to be tamed. Ceredigion could easily feature in a Tolkien novel or film. Mountains, seas, rivers, green hills and hidden mist filled valleys make up the picture; not to mention ancient castles. All combine to give Ceredig’s dominion an air of fantasy. Nearby visitor attractions like ‘King Arthur’s Labyrinth’, Llwyernog Silver lead mine, and Devils Bridge all add to the fantasy theme. It is at the end of the Southern mountain pass road from Llandovery that you will find the small University town of Lampeter. And it is near here that the organic farm of Treberfedd lies. In Welsh the name ‘Treberfedd’ (tre-ber-feth) means ‘place at the middle’. Local folklore has it that a field at Treberfedd Farm is the exact centre of Ceredigion. From that field it is seven miles from Lampeter on the Eastern border with Carmarthenshire and seven miles to the west coast seaside town of Aberaeron on Cardigan Bay. It is in this field at the centre of mysterious Ceredigion, that octagonal shaped houses have appeared. Farmer at Treberfedd, Jack Cockburn, designed these holiday eco cabins to blend into the hillside. The eco cabins are carved into the slope of one of the farm’s meadows. They have a warm blanket of turf on top and the front elevation opens out to panoramic views over the Aeron Valley and the Cambrian Mountains. The little houses are octagonal in shape with large octagonal windows either side of a glass door. Each window is on a different side of the octagon. From the inside you can enjoy a different angle on the countryside from each window. The view is amazing, a constantly changing panorama of sky, hills and mountains in the distance. In fact these octagonal wooden buildings, built from whole Scots Pine trees and welsh grown Douglas Fir, are completely original in their own right. “Log cabins and traditional round houses abound, but you won’t find a building like these anywhere else in the world” said Jack. Jack was inspired by Tolkien’s idea of the ‘Shire’ in his novel The Hobbit. Creating a place for green holidays that has an idyllic pastoral setting and green hills like where the Hobbits lived. From the first chapter of Tolkien’s book where he describes the green and pleasant Shire it is clear that Treberfedd Farm bears resemblance. It was easy for Jack to find a suitable site at Treberfedd Farm which lies atop a hill amongst a series of welsh green rolling hills. “We scraped the earth away from the hillside in the Top Field which is 700 feet above sea level” explains Jack. To further evoke the idyllic rural atmosphere of the Shire, farmer Jack has planted an orchard of welsh apple trees in part of the field. A rustic wooden fence surrounds the dwellings, inside the fence are lawns and cottage gardens are to be planted this autumn. Outside the fence the field is used for grazing the farm’s organic sheep flock. The eco cabins are right in the middle of sixty acres of organic farm land and woodland which guests are free to explore. Chickens provide free range eggs and home produced beef and lamb is available. The organic shop in Lampeter provides a full range of other local cheeses, beers and vegetables. Green electricity for the under-floor heating and shower comes from the farm’s wind turbine in the field behind. Winter and autumn holidays are made cosy by the log burner which is fueled by wood grown on the farm. The unusual antique entrance gate to the meadow is a detail that adds a quirky first impression. This ebay find shows the makers name on the iron hinges. It turned out that this rectory gate was made in Oxfordshire in the 1890’s, the same decade of Tolkien’s birth and the County where he lived. “luckily my sister Hannah was on hand to help with the interior” Hannah and her company Cream & Black has since gone on to win awards for their high quality and imaginative interior designs. Overall these eco cabins in west wales take the glamping holiday to a new level. 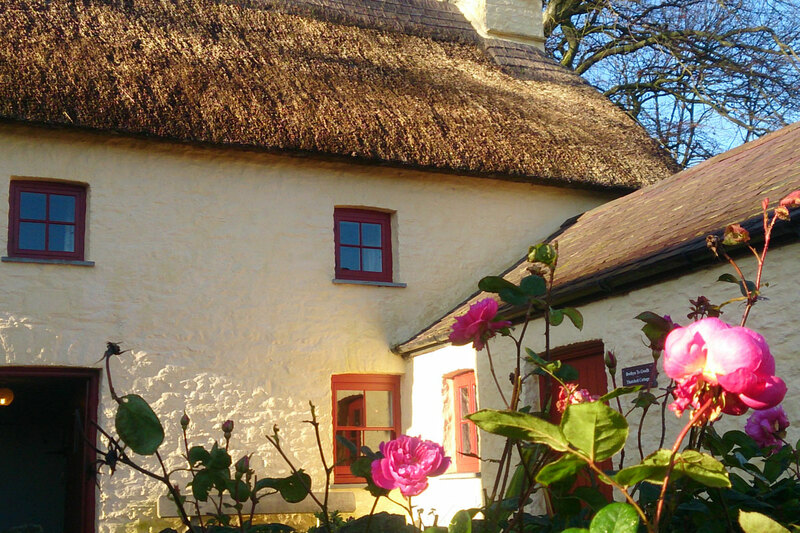 These small dwellings at Treberfedd Farm provide a truly peaceful holiday escape. Inspiration for the original Shire. Tolkien wrote at a time when the din and smoke of rapid industrialisation were devouring his beloved English countryside. Imagining a kinder less severe world Tolkien reacted to create ‘The Shire’; a pastoral idyll where his Hobbits-representing ordinary folk- live in extremely comfortable “holes in the ground”. Their lives centre on what really matters; good dinners, enjoying the company of friends and family, telling stories in armchairs pulled in front of warm fires, country walks and looking out of a window to appreciate a fine view down to the river. This is the kind of holiday destination that Jack has created at Treberfedd Farm. The Shire Tolkien describes evokes a simple life that charms and captivates. Who wouldn’t want to live in a green and pleasant land like this? It is in this spirit that Treberfedd Farm offers the perfect country escape. By Jack Cockburn, July 2015. Please get in touch!